The Seagull Artist Series of Guitars are Seagull’s top of the line guitars. 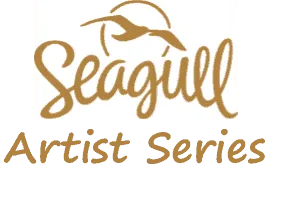 They are all solid wood acoustic guitars and although they are the top of Seagull’s line, they are still really affordable, considering their high level of quality. O.k. Let’s take a look at all the guitars in the Artist series. There are 7 guitars in the Artist series. The “Element” in the names signifies that the guitar has L.R. Baggs Element electronics installed. This is on all of the new models. They used to have the Godin QII electronics – so you might see some of the older models labelled “QII” in place of “Element”, in their name. All guitars in this series feature hand selected pressure tested tonewoods and are constructed by Seagull’s top luthiers. The first guitar in the series that we will look at is the Artist Mosaic. This guitar is seriously good value (IMHO) if you like the sound. Under $1,000 for an all solid wood is great – and pretty rare. It has a Solid Cedar top and Solid Mahogany back and sides, which produce a nice warm tone. If you’re into a brighter tone check out the Artist Studios below. There’s nothing spared on these guitars which is great to see. Quality materials and construction with a bunch of unique features. The Artist Mosaic has a 1.8” (45.7mm) neck – which is wider than on most modern day dreadnought acoustics. So if you like a wider neck width (great for playing finger-style), then that’s another plus to these guitars. The Artist Mosaic Element is essentially the same guitar as the Artist Mosaic. The only difference being that the Element version is installed with L.R. Baggs Element electronics. Of course you pay extra for the electronics. So, if you need electronics then this is the model to go with. If you don’t ever plug in, then go with the Artist Mosaic to save yourself some dollars. The Artist Mosaic CW Folk Element model features the same materials as the Artist Mosaic but it has a few distinct differences. The folk body is smaller and narrower and has a more defined waist than the dreadnought models. This produces a tone more suited to finger-style playing than the dreadnoughts. Still good for strumming and flat-picking but if you incorporate a fair bit of finger-style, then this might be the best choice for you. It should give you a stronger mid-range tone and will be less “boomy” than the dreadnought models. Now we come to the first of the two Studio models. The Artist Studio is actually quite a different guitar from the Artist Mosaic. There are a lot of similarities but the tonewoods used are quite different and will produce a very different tone. As you can see, the Studio has a Solid Spruce top (Mosaic has Solid Cedar) and Solid Rosewood back and sides (Mosaic uses Solid Mahogany). This tonewood combination has a brighter tone with enhanced dynamics and projection. This has that punchier sound that you would associate with a spruce/rosewood combination. If this is more your sound then this would be your preferred model over the Mosaic. This comes only as a cutaway model and with electronics. The second Studio model is quite a different guitar again. Like the Studio CQ Element, the Concert Hall version has the Solid Spruce top and Rosewood back and sides. But it is in Seagull’s Concert Hall shape, which is smaller with a more defined waist than the dreadnought version. It has the L.R. Baggs Element electronics but it doesn’t have a cutaway. The Concert Hall shape makes this model more mid-range focused and produces a less boomy sound when compared to the dreadnought model. It’s also more suited to finger-style players than the dreadnought. Seagull also considers this a great option as a guitar for recording. The other cosmetic thing that varies is the sunburst finish on the top. You can check out the dimensions for the different Seagull guitar shapes/sizes in the table below. Now we move onto the Cameo model. The Cameo has Solid Spuce top, like on the Studio models but has Flame Maple Back and Sides. This is the major difference between this and the Artist Studio CW Element. As you can see, apart from the back and sides it’s quite similar to the Studio model, with some other cosmetic differences. Finally we come to the last in the Artists Series, the Artist Peppino Signature. This model is the most expensive in the line, but not that much more than the Studio CW Element. It’s also very similar to the Studio CW Element. In fact, the only obvious difference, as far as I can tell, is that it has a wider nut width. The nut width is 1.9” (48.3mm). This is very wide for an acoustic guitar (closer in width to a classical guitar nut width). This will make the Peppino even more suitable for finger-style playing but less suitable for strumming and flat-picking. The Peppino is designed to suit the style of Peppino D’Agostino, which is predominantly finger-style playing – pretty awesome finger-style playing at that. Check out the video below which shows Peppino playing one of his original compositions on a seagull guitar. Note the wideness of the neck. So there you have an overview of the Artist Series guitars. There is a bit of diversity in there but there are also a lot of things that they have in common. For the materials and the sound that you get out of these guitars, you get a real bang for your buck, in my opinion. If you want to learn more about the Artists Mosaic, check out my full review of that particular guitar from this series at the link below. I plan to do full reviews for the other models at some stage too. Those are MAP prices, not MSRP. I take it that MAP stands for Manufacturer’s Actual Price? I haven’t heard this term before but I’m guessing that’s what you mean. I will make the changes. Thanks for the correction. Minimum advertised price or MAP is the practice of a manufacturer providing marketing funds to a retailer contingent on the retailer advertising an end customer price at or above a specified level. Very interesting – thanks for the information on this. I was not familiar with this term. I just saw on the seagull website it had MSRP so I assumed that’s what it was. But they obviously do it a bit differently to most guitar manufacturers who tend to use MSRP. Prices are usually lower than MSRP but with MAP, as you say, the price will be the MAP or higher. Good to know. Thanks for your message. I would be happy to recommend a guitar for you. I will send you an email and if you can reply to that email with your details I will recommend what I think is the best guitar for you. Hi Nate, I have question if you could help me out. For the specs on the artist studio CW element on the guitar center website it states that it’s a solid cedar top, which seems incorrect cause the studios are spruce tops, but just wanted to make sure and on the Sam ash website for the fingerboard it states that the finger board is ebony. These were the two things that seemed off. Just wanted to make sure that the specs you’ve provided on this website are accurate. thanks. Six String Acoustic, great site, thank you. As per a communication this month with Seagull client services, as of 2017 all Seagull SWS and Artist Series guitars now come with a Ritchlite composite fingerboard not Rosewood. This is a an important spec, so you should update your specs for those guitars. Why they did this have no idea. Money? The money they save using Ritchlite will be lost in lost sales. Mine being one of them sad to say. Just silly, because even if they raised the price I would have still purchased. Not many want a resin and paper, heated and molded fingerboard on their quality all solid wood guitar. It absolutely effects the transfer of vibrations within the guitar and the sound in a negative way. What a shame, it WAS a quality guitar. Oh well.